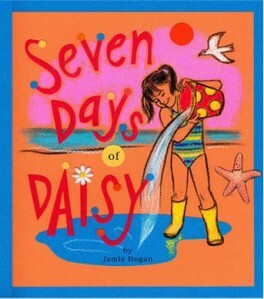 Jamie Hogan’s Seven Days of Daisy just received some well-deserved press in the Portland Press Herald. In a prior post, I shared how Jamie debuted a self-published version of her first children’s book in August of 2009 at the Peaks Island branch of the Portland Public Library. Since then, the vibrantly-illustrated book caught the eye of Down East Books and they offered to re-release it this spring. Islanders will shake their heads when they realize that the four-year old Daisy that graces the book’s cover is already fourteen years old. But fear not, Jamie’s Seven Days of Daisy captures the timelessness of a Maine summer and allows even the young at heart to escape back to their childhood.